Do you ever have one of those moments when you want something and you "think" you have all the ingredients. Well I had my mind set on make this Cherries in the Snow from The Country Cook but I didn't fully read the directions when I went into the kitchen. You see, it needed a few hours to rest in the fridge and my tummy wanted something right away. So after a few minutes of feeling disappointed, I decided to throw something together with the ingredients. I didn't have any graham crackers BUT I did have some vanilla wafers I had been holding onto for while. I have been trying to make a banana pudding for the longest time. Either the bananas would go bad before I had a chance to make it or the family would gobble them up. So I gave up on making that for now. The family loved these and wanted more. My tummy was happy too. These literally took me just a few minutes to throw together. That is my kind of recipe. Do you have a go to recipe for a quick family treat? Mix the instant pudding according to package directions. Gently fold in the container of whipped topping. Crush the vanilla wafers ( I place in a freezer bag and whack it with a rolling pin) and place in the bottom of your containers. Spoon in the pudding mixture. Top with the cherry pie filling. Enjoy. Sounds delicious!! I do adore cheesecakes. Thanks Catherine, these are super easy and do not disappoint! Thanks for stopping by and I hope you get to try these. 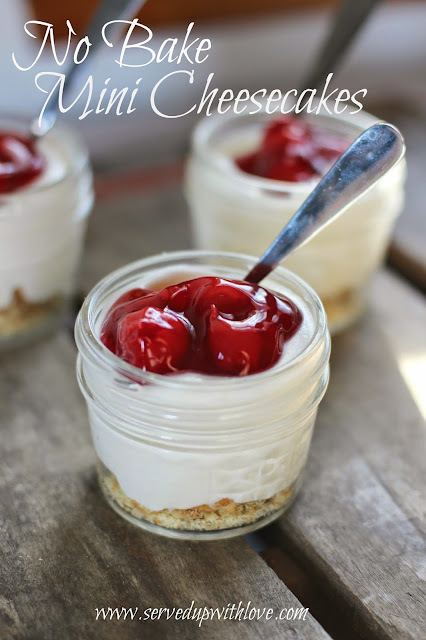 I'm crazy for cheesecake...and simple recipes like this one. Oftentimes those easy ones are the very best. This is right up my taste bud alley. Thanks so much for sharing with us at Weekend Potluck. Please come back again soon. Thanks Marsha, this one a threw together in a few minutes. My kind of recipe.